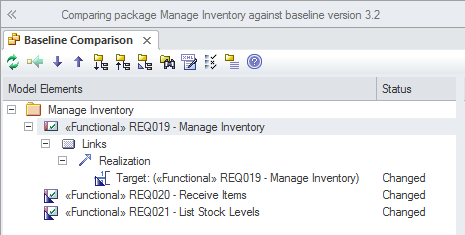 The Baseline Tool can capture a snapshot of the Requirements at a point in time and then at a later time the repository can be compared to this (or another baseline) for the purpose of determining what has changed. Any number of baselines can be created and labeled and there is a baseline comparison tool which displays the differences between the baseline and the model and allows the modeler to revert a change in the model to a baseline at a granular level. Baselines are also useful when a formal requirements process is being followed or the Requirements form part of a contact, as the baseline can keep a snapshot of the requirements at important milestones such as contract signing or requirement phase sign off. This is also applicable to iterative and incremental processes such as Agile methods, as the requirements can be baselined before or even after a Sprint. When Requirements are still volatile and the Requirements' owners are still formulating their needs, a baseline can be created to take a snapshot at important points in the analysis phase, such as after an elicitation workshop. 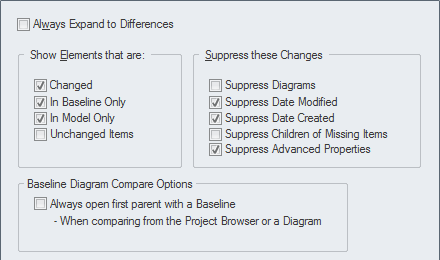 There are several options that can be applied to configure the way the Baseline Compare tool presents information; these are available from the Options button on the Baselines window.